I hope you are all having a wonderful weekend!! I have been busy busy...I think I said these cabinets would take about 5 more hours...Ha! More like 10...or more! I've been working on them in between other stuff, but it is a little more time consuming than I remembered. I glazed these cabinets before we moved in the house almost 8 years ago. I had the painters paint them a cream color. I think the name of the color was alabaster... I'm going to have to check on that. You can see in the bottom cabinets that I put a very light glaze on them. I didn't want to mess them up at the time and really didn't know what I was doing either. Through the years I've always thought they needed a little more glaze to darken them just a little and add more warmth to the kitchen. Finally... after almost 8 years I've decided to tackle this project again! As you know I am also adding new hardware which really updates these cabinets! Love it! Click to enlarge the pics and you will be able to see the difference. It's not a huge change, but just enough to add a little more warmth and update to the kitchen. You will need rags for staining and wiping and drop cloths for the floor...oh, and gloves unless you want brown stained hands like mine! 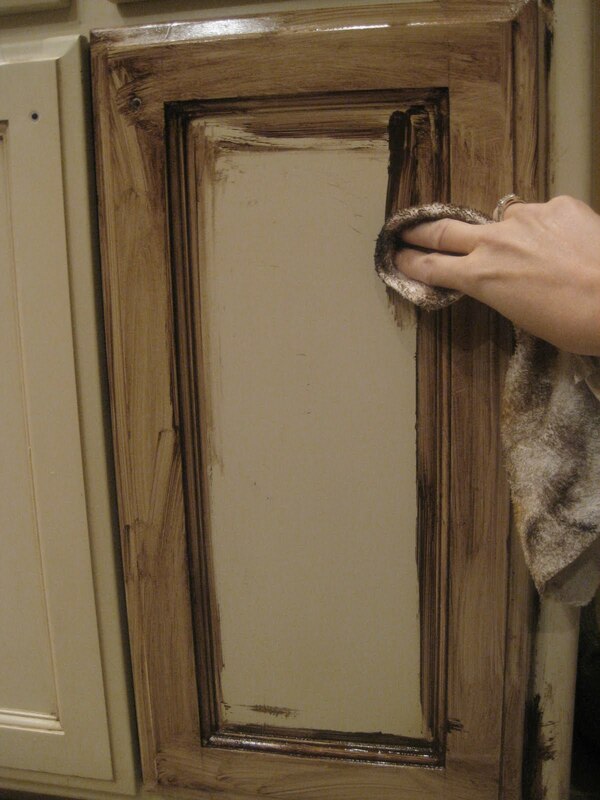 Dip the rag into the stain and rub it on the cabinets letting more stain seep into the creases. Messy Messy! Be sure to cover the entire surface with the stain. Last, with a clean rag start wiping it off in an up and down motion (especially in the middle) getting all excess stain off. You can leave as much as you like in the creases. That's all there is to it! See...it's pretty easy to do. Just a little messy, time consuming, and you will get your exercise! lol..I had to turn on the air! 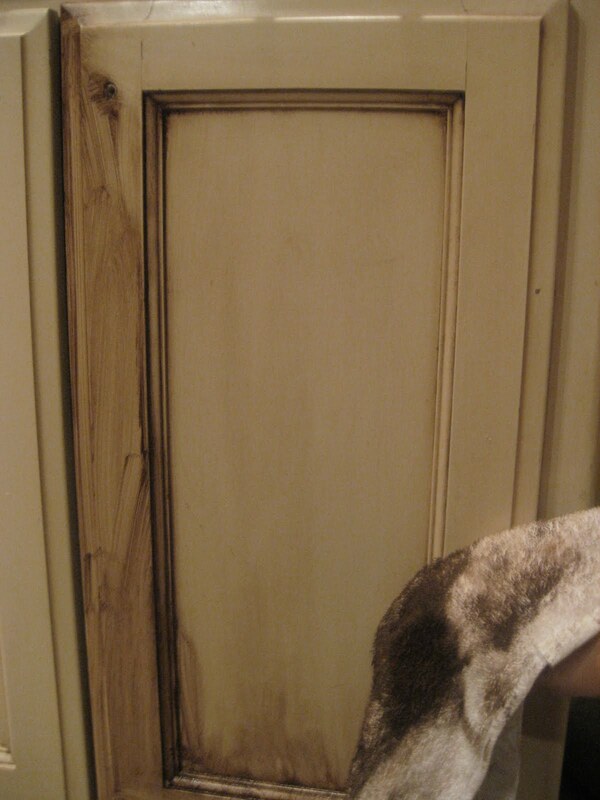 If the cabinet paint is chipped it is going to show up dark when you add the stain (I found that out pretty quick) so you need to touch up all chipped paint. If you enlarge this last pic you will see some chips on the right hand side. 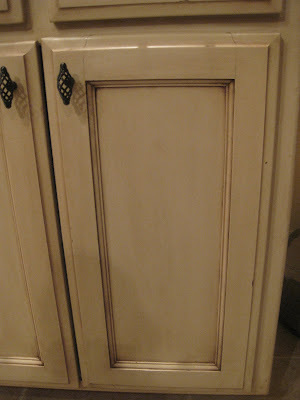 Some of my cabinets have several chips in them so I am going Monday to get more paint. Once I touch them up I will just add a little stain over it and they should look fine. If you have any questions please let me know...I am no expert on this, but will try and answer your questions on this post. Just as soon as I'm done I'll post the entire kitchen! Question: Does the stain have a sealer in it or do you have to apply a poly topcoat to protect the finish? The stain does not have a sealer in it. I talked to the lady at the paint store and she did recommend a topcoat, she said alot of people don't put one on though. I did not apply one last time and it stayed on just fine. I am going to recommend it and when I'm done with everything I plan on putting a topcoat on. I am joining Carrie at Dittle Dattle and Susan at Between Naps On The Porch. Please pay these wonderful blogs a visit! P.S. If you make a mesh wreath please e-mail me a picture to feature here on my blog! question: does the glaze stain have a built-in sealer? ...or do you have to put on a poly top coat to protect the finish?? Beautiful! I even like the chippy look too. Love your easy tutorial as well! WOW, I love it! Thanks for showing us how to create that look! Great job they look amazing. Kirsten, the cabinets are coming along beautifully! I really need to tacle my kitchen cabinets too. Thanks for answering the question about appling a finishing topcoat. I was wondering the same thing. PS~ I really love the new hardward!! This is one of those projects that the moment you do one door you really have to follow through! I think it is brave to attempt it and they are turning out great. I hope you will post a picture when they are all done. Great tutorial. They really look good Kristen! Wonderful, Kristen! I love the warmth it adds to the cabinets. The new hardware is perfect. It is amazing what new hardware can do for cabinets. I agree with some of the others..I like the chippy look, too! All this hard work will be so worth the end result. Beautiful! The cabinets look awesome-beautiful job! That new hardware is the perfect finishing touch. You said the paint color is alabaster--what brand would that be? They look great! My cabinets are white and I have been afraid to glaze them. After your tutorial, I may have to give them a try. This is really pretty. Thanks for showing us how. I have a friend who wants me to do hers, so this was just in time. They look great...this glazing looks so good...I have been doing some project using it and love it!!! I found your post just as our painters are trying figure out what product to use to get the effect I desired. Thank you for the visuals and product recommendations! Beautiful result. Love it! I want to do our back pack cubbie area. Thanks for showing how to do this! Your cabinets look fantastic! The color goes perfectly with your backsplash and countertops. My husband and I recently painted and stained our oak cabinets, it's amazing how a little paint and stain can totally transform a space! I love this look, so warm and inviting! I've been a follower for awhile now and enjoy your posts. I would love if you stopped by sometime. Hey Kristen!!! Ive been missin you girlfriend! I see you are BUSY with the GLAZE! Eeekk! Ive done about ALL the glazing I can do! You are ROCKIN with the glaze and doing a BEAUTIFUL job!!! They look AWESOME! I cant wait to see it all finished!!! I LOVE your Easter wreath too! Just came across your blog and I love it! Love your style! I'm going to be moving into a new house in 2 weeks and I can't wait to decorate it! You have given me some ideas! Kristen I ran across your blog doing a search on how to glaze cabinets. Its funny because we have the exact same cabinets and the exact same birdcage hardware. We have been trying to figure out what to do with our cabinets for a while, we just put in a new counter top (custom concrete) and did a tile/glass mixed backslash this weekend. Now we need to change the color of the cabinets. This is very inspiring for us and I love the pics you posted. Great job and thanks for sharing! I just found your blog and it is great. You have given me so many ideas for my home. Kristen, your cabinets are beautiful!! would you find out exactly the base color you used and whose paint it is and also if you used acrylic or oil, and was it satin, or semi gloss?? Kristen I do like this style of font better for your blog. You're right good choice! Hello Kristen. I happened upon your site when I was searching for instructions on refinishing cabinets. I have oak cabinets that have been stained and poly'ed. I know I will have to sand them somewhat to add a coat of paint but I am wondering what type of base coat you used? Is it a satin finish? And can you apply the stain right over that? I love the look you achieved on your cabinets and would like to do the same on mine. Thanks!! 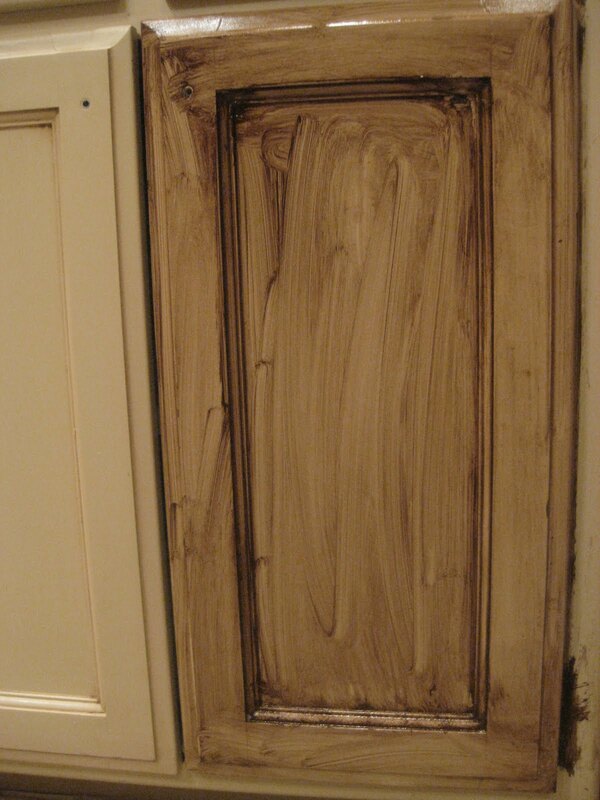 I have the exact paint/finish on my kitchen cabinets and quite a few nicks now that really bother me. I do NOT know the color of the cabinet or the glaze/stain. I want to touch them up but what happens if I start and the paint isn't the right match? I don't want to mess it up and have to paint the entire kitchen again! Absolutely LOVE what you have done to your cabinets. I hate to repeat the question of the brand/color of paint you used but it looks like your responses must have gone straight back to the questioner since the blog did not publish your answers. After doing what seems like a bazillion searches on this topic I am finally inspired by your project!!! Ready to tackle some work and get a new look. I'm curious. Is the gel stain as oil based finish? Once you apply it, do you have to topcoat with and oil based or waterbased topcoat. I've been experimenting with glazes, and am still unsure what to do. 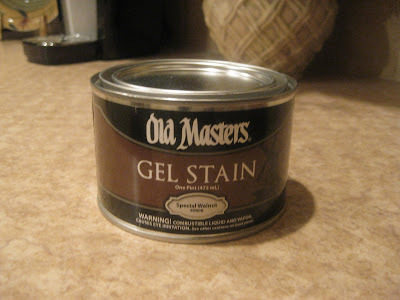 I like the look of the Masters stain, but don't want to run into a problem with using different products that could be a disaster if used together. 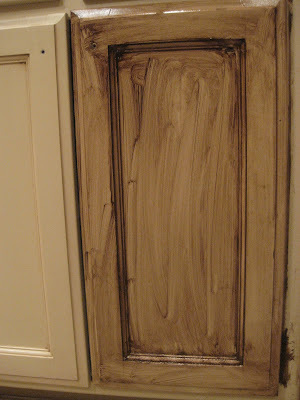 My cousin applied a new waterbased paint to her cabinets, and the paint ended up peeling off, because they were oil based. Thanks for a great post. Thank you for this post. This really looks so easy, a little messy but surprisingly very easy. My current cabinets (even for closets Bergen) are somehow the same with what you originally have so I guess this is going to be a wonderful idea. Again, thank you for sharing these steps. I really appreciate it. Keep on posting. Do you think I could use this stain color over white painted cabinets? We are about to glaze our cabinets ourselves and this was so helpful! My question is, what about the "kickplate" or whatever the piece of wood at the bottom of the cabinet is called? The like 3" high piece from the floor to the bottom of the lower cabinets? Did you glaze it at all or just leave it the original color? The cabinet paint is alabaster in what brand of paint please? 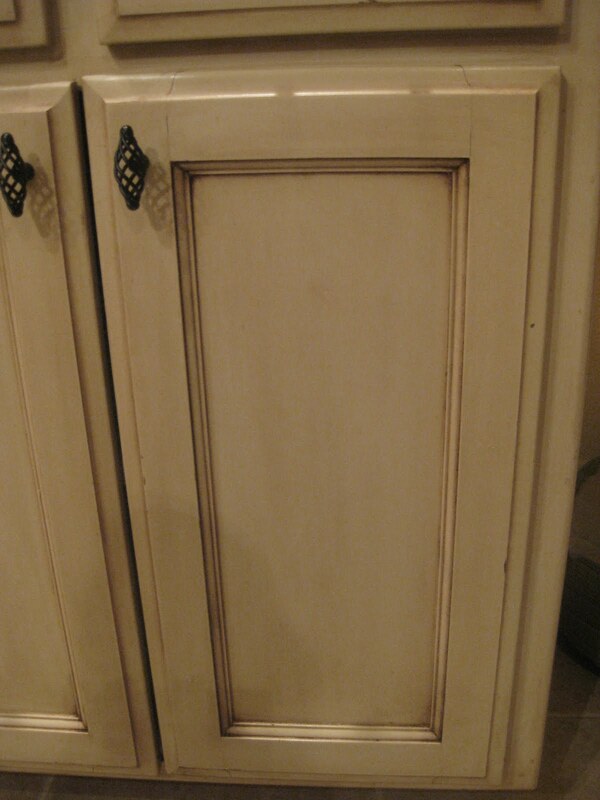 This are the same cabinet color I have from the manufacturer and you did a beautiful job on the glazing! I want to thank you for the information. I tried this out this weekend and I'm so happy with the results! I have a question though, my dresser feels sticky. Will it dry or do I need to put a coat of some kind on top? 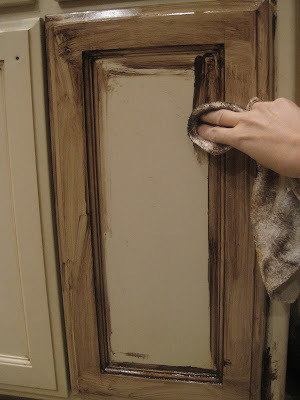 I didn't read all the comments but I just retired from faux finishing business and have used Old Masters for many years, and for kitchen cabinets I would recommend always using a water base sealer! A couple of coats, sand between! Wow. These turned out really nice. You're pretty brave though. 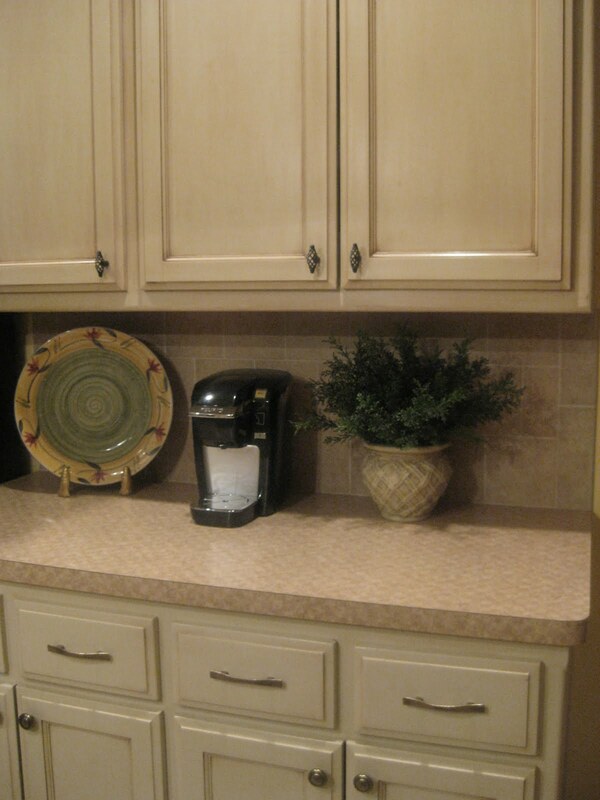 Not everyone can glaze their kitchen cabinets and make them look great like that. You didn't need to sand first? Just clean well and gel stain? I was wanting to paint my cabinets and my thought goes to the type of paint I should use, should it be semi gloss or gloss that I use to paint with b4 I use the glaze.and the top coat would that be polyurethane? Good read, This blog has provided the helpful data to us, continue the good work. These cabinets are looking so beautiful. Would love to try it on my cabinet as they are quite full of dust and dirt. Hi that had been amazing to recognize to find out. Relation toward amazing write-up. Special almost all compared to of which.. kitchen cabinets mesa az I simply at this point want to found substantial thumbs additional technique up toward excellent details you can have within with this write-up. We have been satisfied anytime evaluating your exclusive publish joined having current facts! Relation commit plus feel you possibly can write-up further internet site which are relevant to this kind of web site. Can you use this over oil base paint that is about 12 yrs old? nice post.. thanks for sharing this. you put a great effort in this post. Nice Blog, Really Good Content, Really Helpfull for us, I have also a Some Great Content For you Guys, so just go through and take benefit of that. These kitchen designs are impressive. Without an ornamental kitchen cabinet, your home decor is imperfect. It will not appear complete if an important section of your home remains untouched. So, this time, get a custom kitchen cabinet for your home and give a perfect decor attraction to your home without compromising with the overall home interior. No matter how big your house is,( đá sapphire xanh đen) whether you have just bought( ý nghĩa của đá ruby đỏ) a brand new car, or even how much money you have(mua đá ruby đỏ ở đâu) in your bank account, your grave is just that much. ruler. Be humble. The designs of the kitchen are impressive.